All ready for Halloween? What are you going to be wearing this year? I'm foregoing Halloween festivities this year. Sadly, we don't have any trick or treaters out this way. I say sadly on one hand, but on the other it's not a bad thing, because I have NO excuse to buy Halloween chocolate and if I decide to, I don't have to share! Bwa hahahaha!!!!! I'll fess up to buying a small (is a 24 pack small...lol a chocolate two-four!) For those of you that don't know what a two-four is, it's a case of beer.....24 to be exact! Anyway, I bought a 24 of a combination of Wunderbar, Caramilk, Crispy Crunch and What are they called...oh yeah, Mr. Big....I think my Mr. Boy Big got most of them, it was really just the Wunderbar I was after! 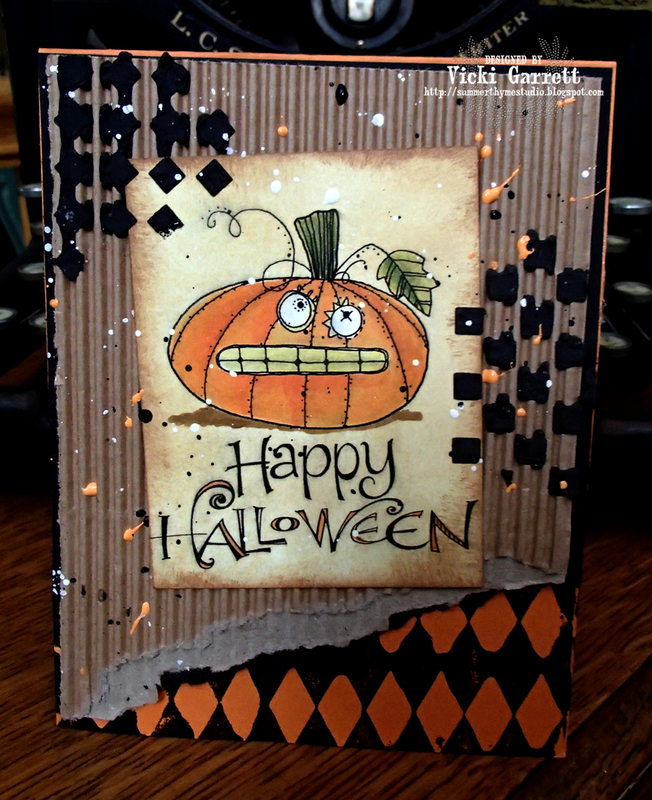 Anyway, that was the extent of Halloween around here, except for the card making and scrapbooking. 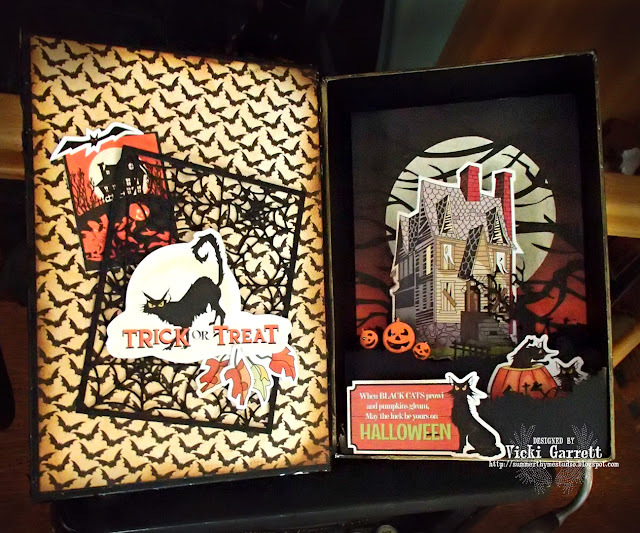 I figured I'd get one last creation in as the Halloween images in the fall release from Impression Obsession were simply scrumptious!!!! 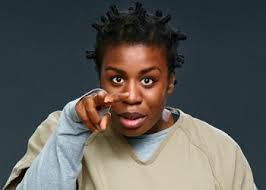 I absolutely LOVE Crazy eyes. I'm wondering if the stamp artist is a fan of the Orange is the New Black. I loved the first two seasons and Uzo Aduba is my favourite actress on the show. Okay So now for my card!!!! I added the corrugated cardboard later and then secured the main image, which I coloured in Touch Twin Marker and sponged over in so saffron and vintage photo. Then comes the fun part.. I added a touch of black paint to some whipped spackle and added the checkerboard to each side of the image. I finished up with Orange, Black and White Paint Splashes ( I diluted Dylusions paint with a little water)...... and that's all folks!!!! If you're heading out for the night, be safe! Oh My! What a blustery week it's been here. Although it's really windy, the sun is finally peeking through the clouds and it's warmed up a bit. Yesterday I had a little bit of time on my hands (erm, I should say I MADE a little time......but who needs to do housework when there's cardmaking to do!). I love playing the sketch challenges over at Splitcoaststampers. 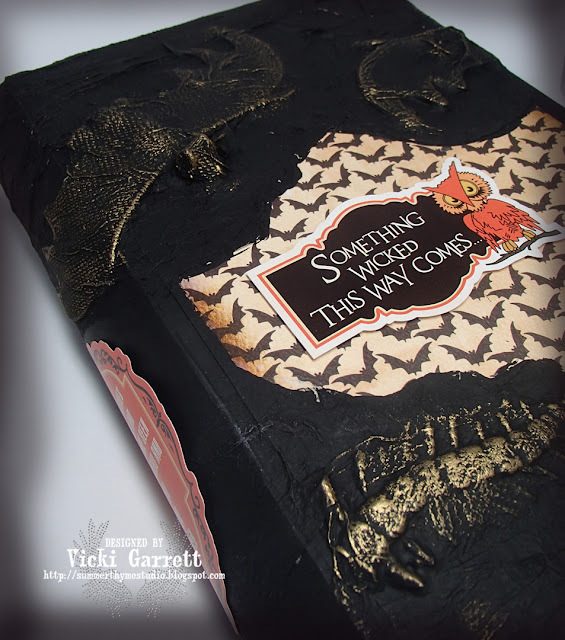 For those of you that have never heard of it, it's a wonderful stamping community with loads of inspiration and tutorials! 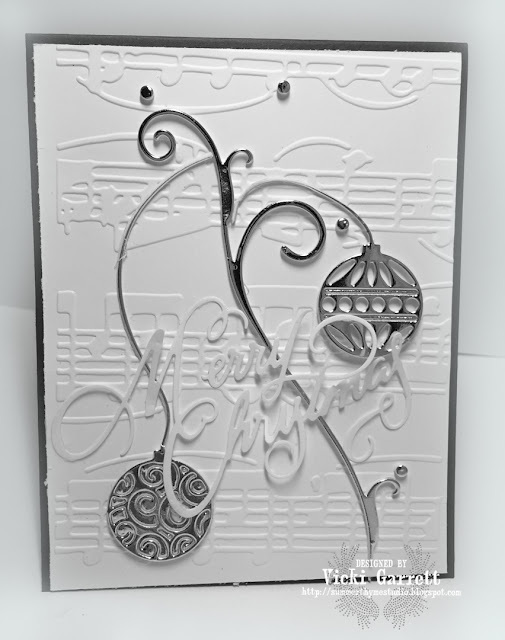 Anyway, I decided to create this shaker card for the sketch challenge. To make the shaker portion, I simply used two circle dies to cut out the image that can be found on the Christmas Magic Paper I mounted the inner circle (tree images) on a piece of paper the size of the outer circle so I would have a base to mount the outer circle on, once I added my foam dimensionals. I cut a piece of acetate the size of the green circle and adhered to the green ring to create my window. Then I added some Polar White Flower Soft for my snowy shaker! I assembled the shaker and mounted it onto a larger red circle and then again onto a flower shaped circle. I cut the flower shape out of some cupid's arrow from the sweetheart collection. I wanted a bright pop of the rich pink! 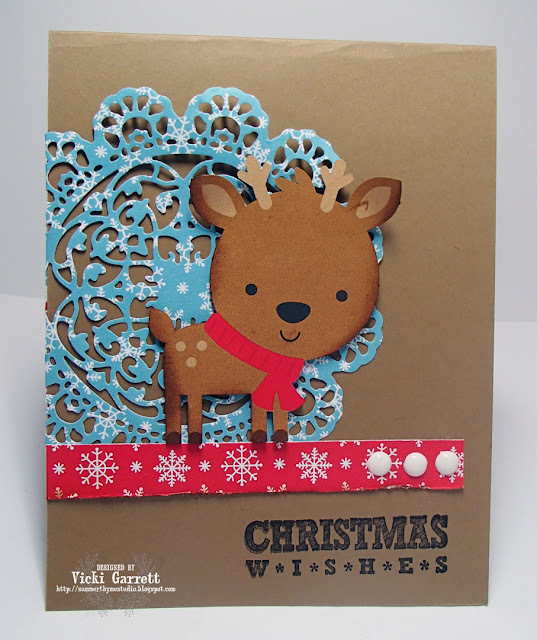 The sweetie little Reindeer is from the Sugarplum Die cuts Craft Kit and the little present and Ju Jube from Kris Kringle Doodle Pop 3-D stickers. I also cut the "Christmas" out of the Christmas Magic paper and finished the sentiment off with some stickers that I found at the dollar store! Hope you like my Whimsical Creation! 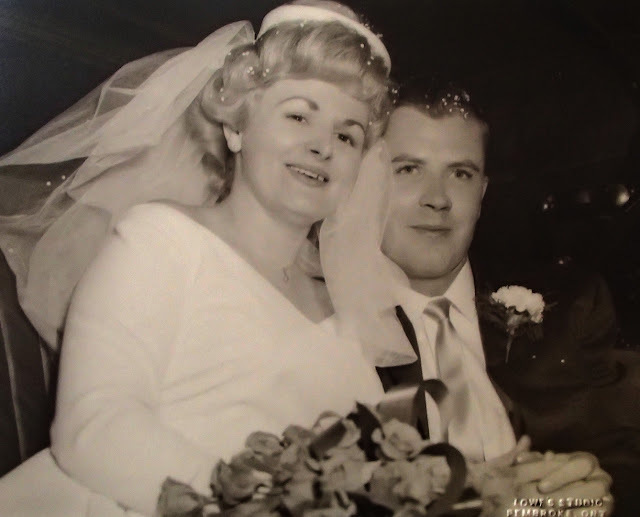 Fifty-three Years is a long time for anyone to be married. Fifty-three years, is a long time. But as you and I know, time flies. I am so proud of my parents for hanging on through the good, the bad and the downright ugly! It takes more than love for a relationship to endure. I'd say it has taken a lot of patience; on both their parts. Sometimes I listen to them bicker at each other and wonder why they're still together. Then there's the tender moments; rarely seen by my eyes, they do get caught occasionally. They grow together gracefully and although they drive each other crazy, they have each other's back. That's a part of their love that I truly admire. Are you all ready for Halloween? I just realized how close we are getting and thought I'd better get this post up! 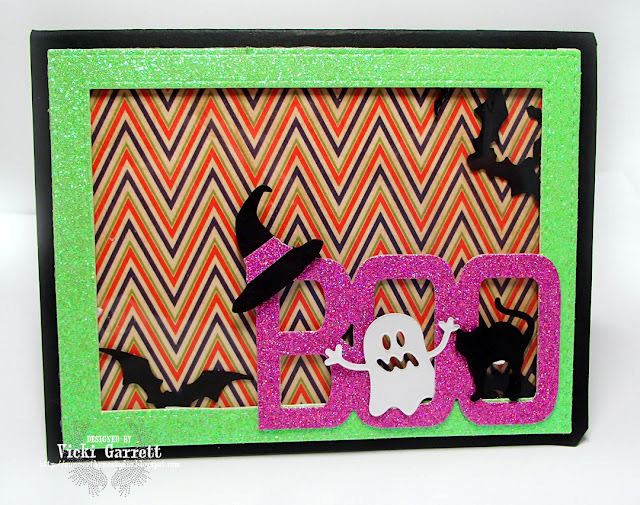 I picked up this fabulous Carta Bella 12x12 Trick or Treat Collection and had only made a card with it. I started working on the altered box a few weeks ago, when I was at Jactopia. So I didn't want to alter the entire cover, after having put the cool bat paper on, so I just altered bits of it! I picked up the bats and centipedes, along with the book box at one of our local Dollar stores. 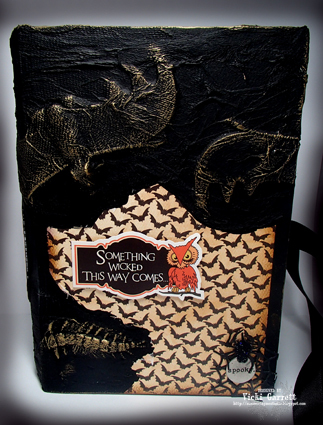 To find out how to do the bats and bugs oh my, refer to the tutorial!!!!! Of course I had to alter the interior of the book as well and had a lot of fun using the sticker sheets that came in the collection. Lastly I used a little Tim Holtz Halloween Medallion! Hope you enjoyed my Spooky Project! Hello! 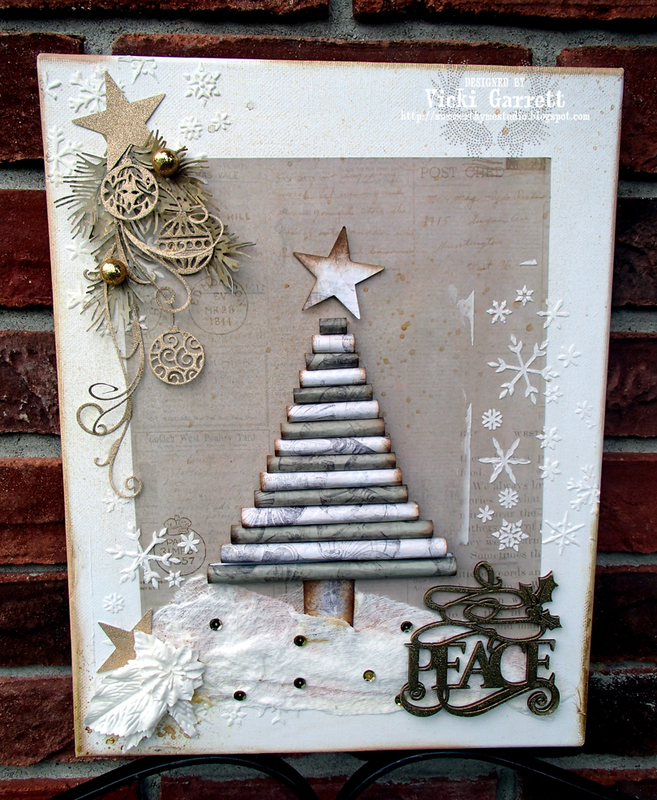 I'm excited to share a project for an upcoming Christmas Class. We're going to create this rolled tree Mixed Media Canvas. How fun is That! I will have a blue toned sample coming soon! Did you all have a good weekend? I know that mine passed WAY too fast! 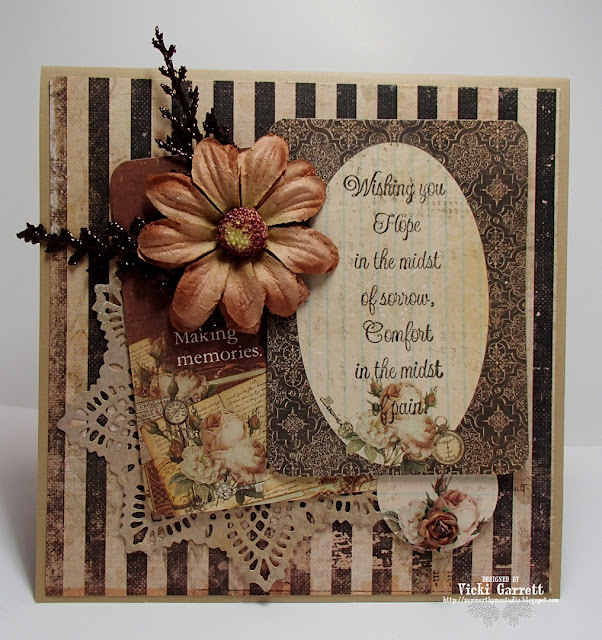 I enjoyed a lovely crop on Saturday with some fellow stampers and scrappers and had a yummy sleep in this morning! What about this cute little gaffer? Getting Sketchy and procrastinating to the hilt! I've been feeling UBER crafty lately. UBER .......what a word, does anyone really use that anymore? Must be the Chic Geek in me! Anyway, I was sitting around tonight, the dishes piling higher and higher in the kitchen; a little overwhelming in all actuality! So what better thing to do to avoid household chores? STAMP of Course!!! I coloured up this super sweet image with my Touch Twin Markers and she's been laying patiently on my night table ( incidentally, does anyone else colour in bed?) to be made into a card. 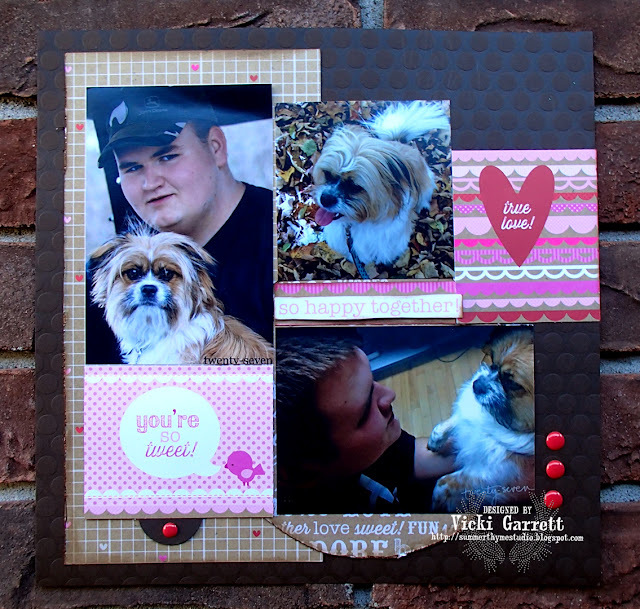 It's been a long while since I've joined the Sketch challenge at Splitcoast Stampers. Love this fun challenge! The image is BAT GIRL or should I say....na na na na, na na na...no wait, that's Batman! GHOULS Just wanna... now what song does that evoke in your hear? Or is it just mean.... Now all I can think of is She Bop! lol. 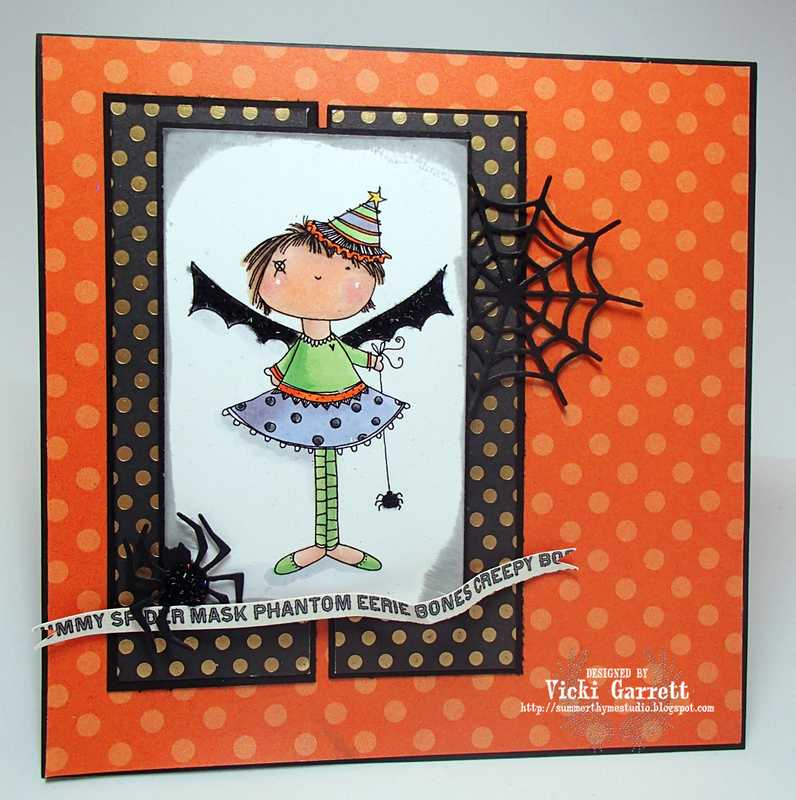 I added a couple of die cuts to stir things up a bit I added the Spider and Web from the Spider Web Die set. Paper is from Recollections- a combination of this years and last years 6x6 pad. I added some sparkle fluff to her wings and the spider....The card feels so soft and fuzzy. No I can play pat the spider when I'm avoiding the dishes. Well I better head to bed before I nod off. I'd like to have fun, but this Ghoul needs her Beauty Sleep or she'll be a witch tomorrow!!! Hmmmm perhaps If I was a witch, I could wave my magic wand and have a tidy kitchen......ahhh, wishful thinking! Hello! Hope you're having a great week! I can't believe it's almost Friday! This week the challenge is to create a card that is mostly blue! 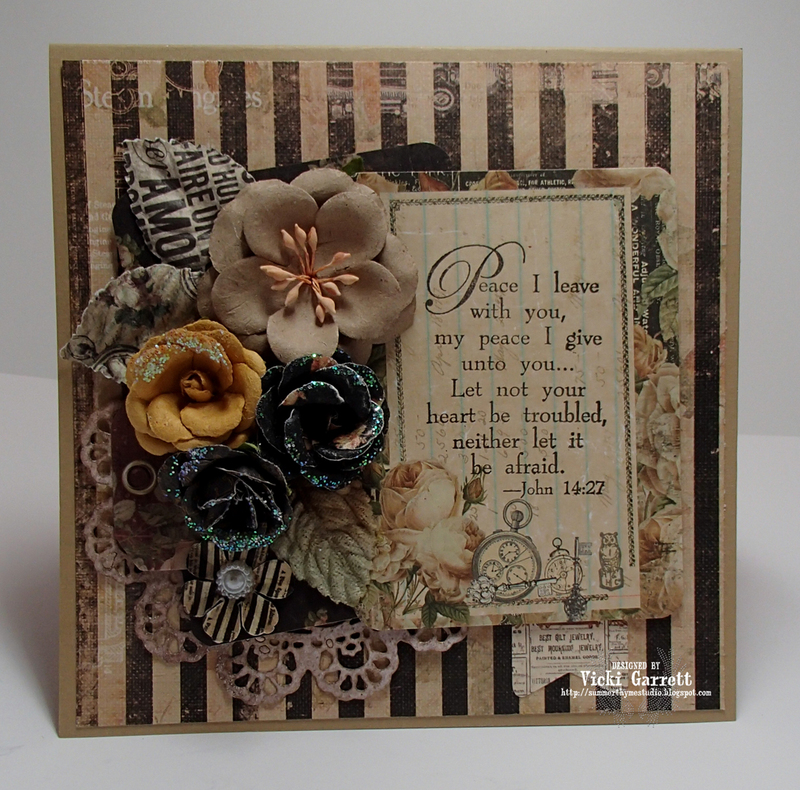 This is a card that I created for last nights Cornucopia of Cards Class. It was inspired by Kim. You can find her card HERE. It just happened to be perfect for this challenge. for a chance to win a lovely Gift Certificate! Here's a list of the players for today! It's always difficult to lose friends. My Parents lost a dear friend several weeks ago. She requested two "Special" Sympathy cards for the Children of her friend. I know when she requests "Special, or Extra Special" cards, she is asking for the multi layered dimensional cards that are Shabby chic, or Vintage in nature. Of course she always prefaces her request by indicating that all my cards are nice, but that she wants me to take some extra care with these ones! 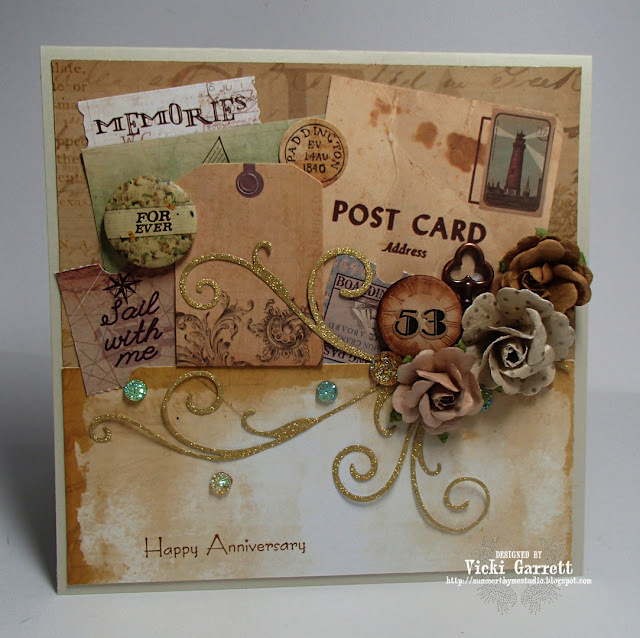 I used various products from Prima Marketing to create the cards, most items being from the Cartographer collection. I do love the vintage look to this line and have lots stashed away for these types of projects! Thanks for stopping by and make sure to hug someone you love today! "His eyes how they twinkle, his dimples so merry"! I've had this picture of Jonathon kicking around for a long time (about 15 years in fact!) waiting for the perfect time to create a layout. 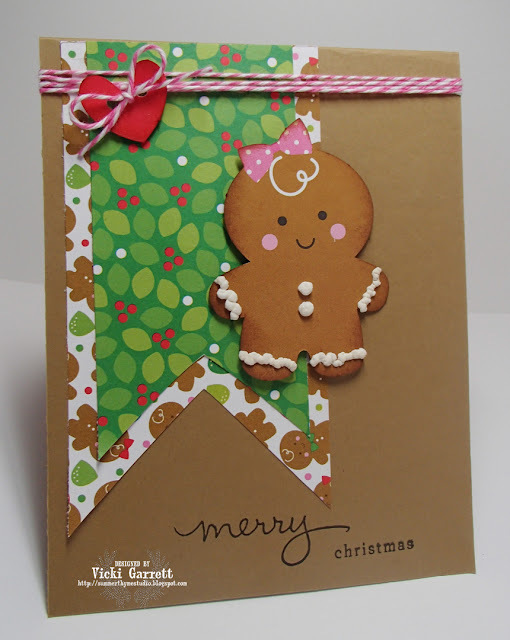 When I saw the Merry & Bright sentiment in this Sugarplum Christmas Collection, I just had to find the picture! Oh my gosh, that little face is the sweetest isn't it? 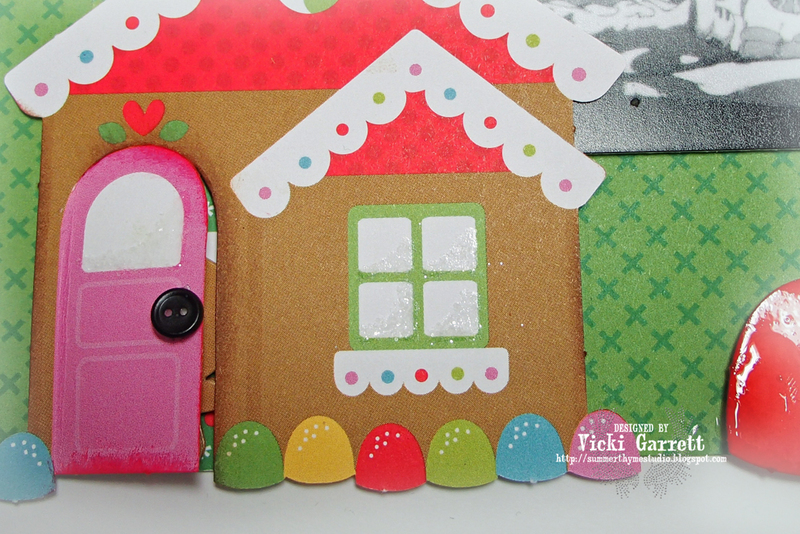 I wanted to bring the little cottage to life a bit, so I used an exacto knife to open the doorway and added some sponging with tim holtz distress ink to the edges. I added some fine glitter to the windows for a little frosty effect! I couldn't resist but to add the sweet little 3-D gingerboy inside the house. Doesn't he look scrumptious? Good enough to eat! I'm so glad I found the perfect paper collection for the perfect picture! Good Morning and Happy Thanksgiving to all my Canadian Friends! I hope that you're out enjoying this glorious day! I'm headed out shortly for a walk! I don't want to miss the opportunity of enjoying this great weather while it still lasts. For most of you that know me, you know I look to the positive and realize the many ways that I have been blessed each and every day. I'm thankful for my family, my work, my creativity and the friends and acquaintances that i've had the opportunity to make through paper crafting. There is no love greater than that of the relationship between man and his best friend. My Boy and his dog. Pets offer unconditional love to their family, as do Mothers to their children. I love my Son and my little Fur Baby Sydney! They both bring joy to my life, along with frustration, worry, laughter and sometimes tears, but I wouldn't trade either of the two for the world! Lastly, I'm Thankful for the opportunity to share my creations with you and the fact that you continue to visit my blog! Have a wonderful day! 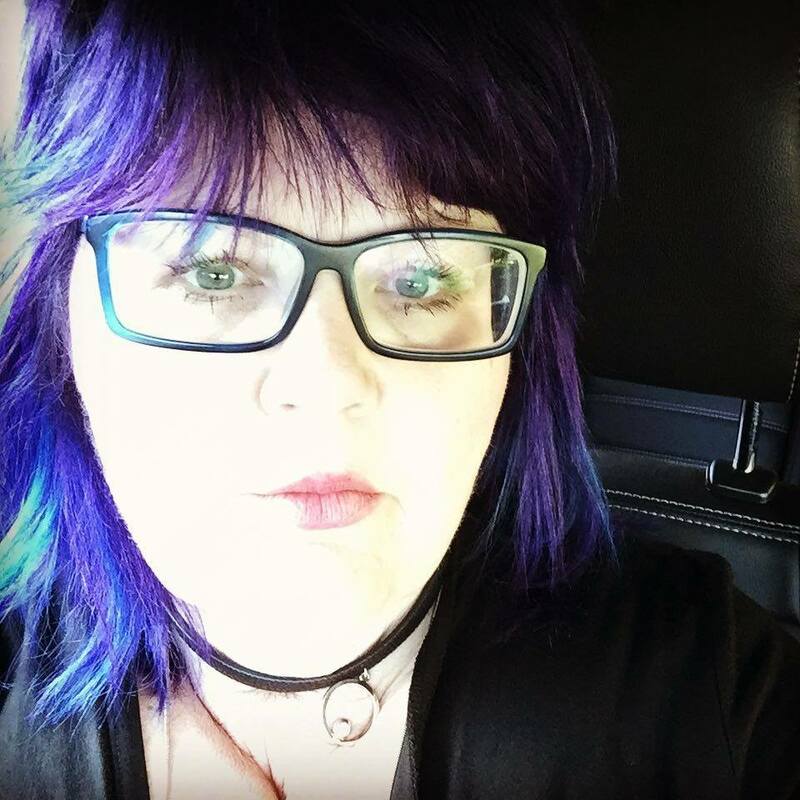 Our Hostess for this month is Kelli! She's given us at 3-2-1 Challenge! Oh! and the Bonus was to make the card pink! I think i'm pretty in pink don't you? 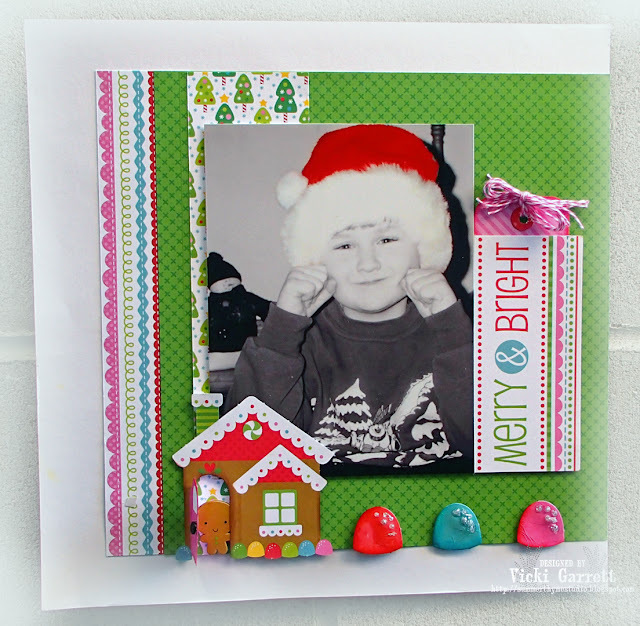 The Doodlebug Sugarplums Collection was perfect for just that!!!! and the pretty little ornament layer is called Tiny Trimmings- Tiny and so stinkin' pretty! For my second embellishment ( I counted the Cottage as number one!) 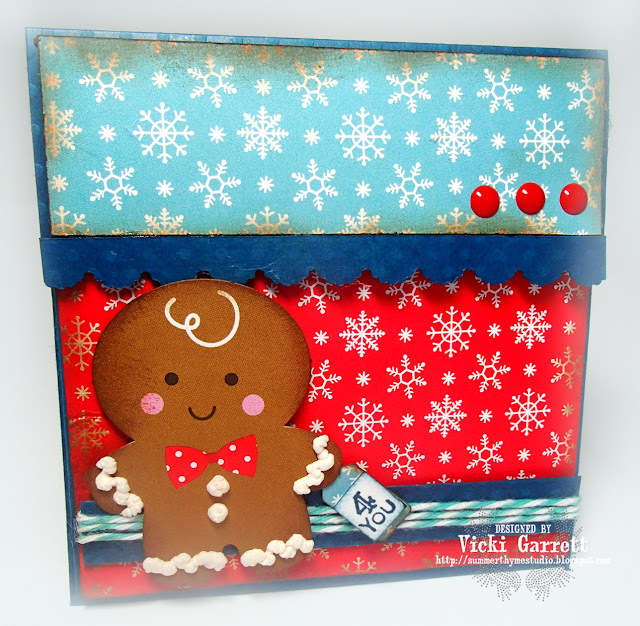 I added three sweet little enamel Christmas dots- Is that a cheat 'cause there are three? I'm going to say NOT...because it's a little grouping and one little enamel dot would have been lonely without the other two!!! Check out the Chicks Cheeky Creations!!! Welcome to the Impression Obsession Fall Designer Die Hop day 2! We have some beautiful new dies to share AND Gift Certificates to give away! For some reason unbeknownst to me, I decided to go monochromatic. I'm usually a fan of colour and rarely ever do white cards. and in keeping with the theme! We will have two days of blog hopping (October 8th & 9th) and THREE prizes! There will be a prize for each of the two hop days (comment entries open until 10pm CT each day) and a bonus prize will be awarded on the final day of our hop from all the comments left for both days. Comment entries will stay open until Friday at 10PM CT. Winners will be announced the following day. Good luck! 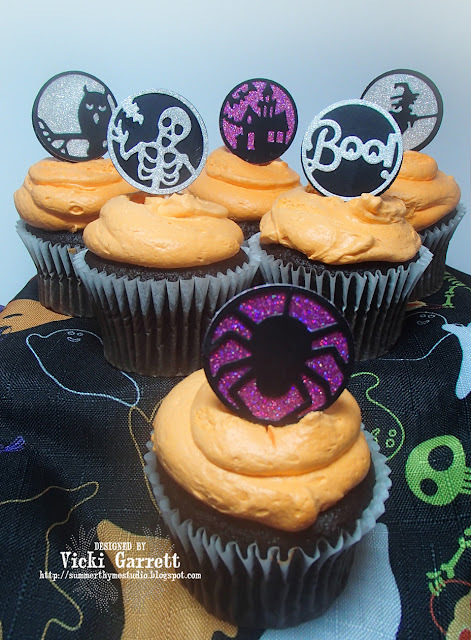 For my first project, I conjured up some Spooky Cupcakes! I have to admit, I didn't make them myself. I had EVERY intention to, but you know how that goes sometimes! When I saw the Halloween Cutout Circle Dies I knew exactly what I wanted to do with them. Besides, it was a great excuse to eat cupcakes!!!!! To make these, I ran the die cuts through the Vagabond and then cut them with a 13/8" circle punch. I cut glitter paper to go in behind the black cutouts and black paper to go behind the glitter cutouts. Then I punched another circle and sandwiched or is that cupcaked a toothpick in between. 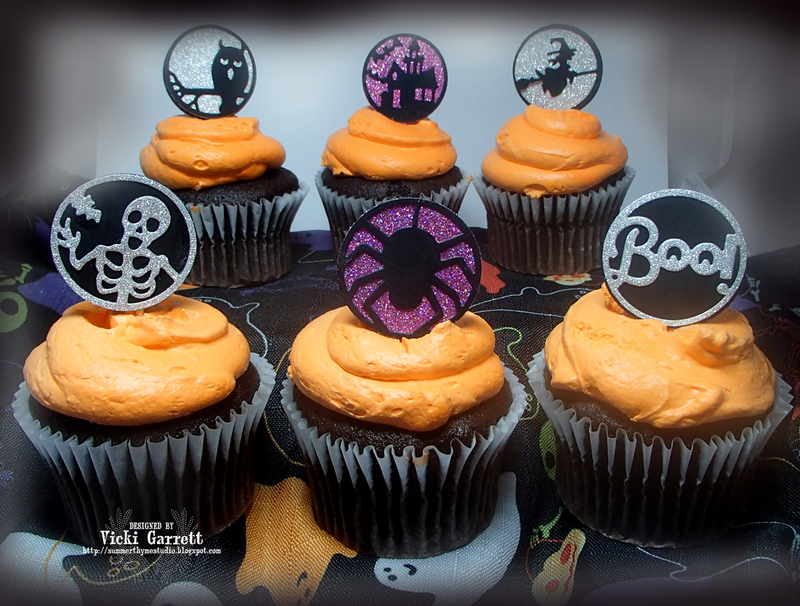 I had to do this very very quickly and grab photos before the ghouls and goblins gobbled up the sweet treats! Last week, I got some amazing Carta Bella Trick or Treat Halloween Paper from Scrappin' Great Deals. 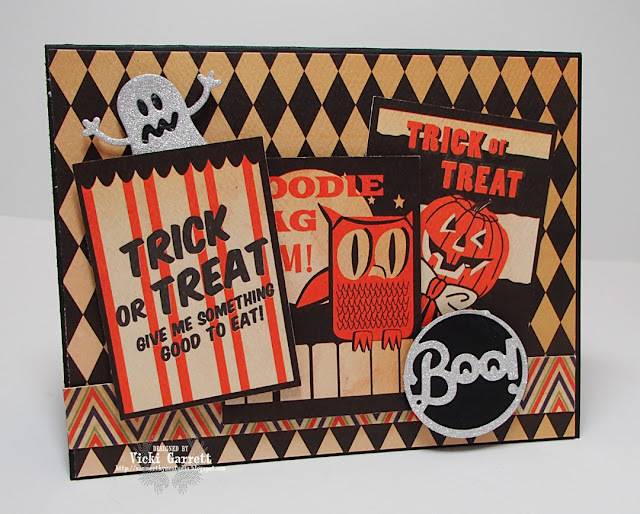 The Paper I used in the next card is the Trick or Treat Paper from the Trick or Treat Collection! This collection is totally RETRO and I may HAVE to purchase a second package as it's Delish! Lastly I created this fun Shaker Card using a larger smidge of the October 31st paper as a back drop. The dies that I used to create the card include"
Because I have a hard time copying link lists, I'm going to direct you over to the IO Blog to get all the links for the hop! 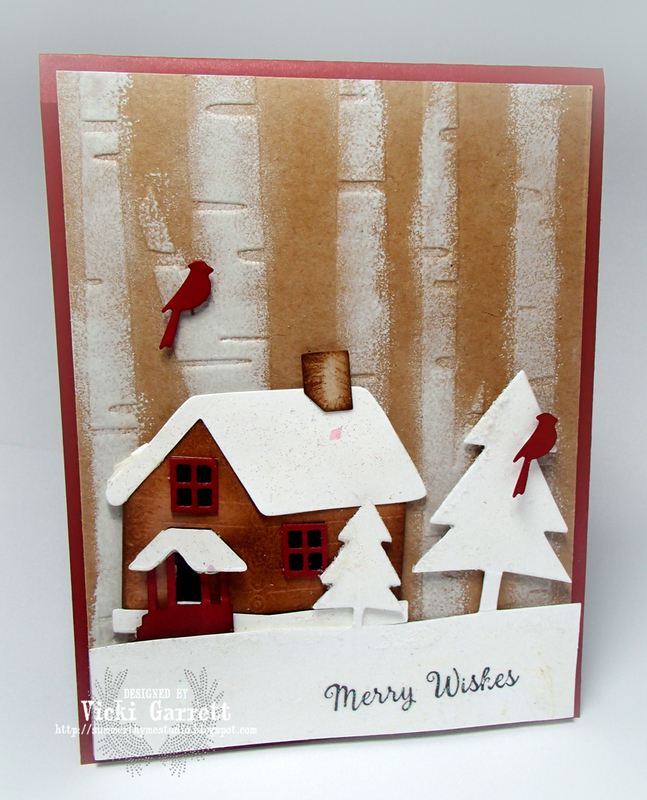 I then sponged white Craft ink onto the birch trees. I sponged the edges of the cabin with Tim Holtz Distress in and painted the snowy parts with Vica Crystal Gel. 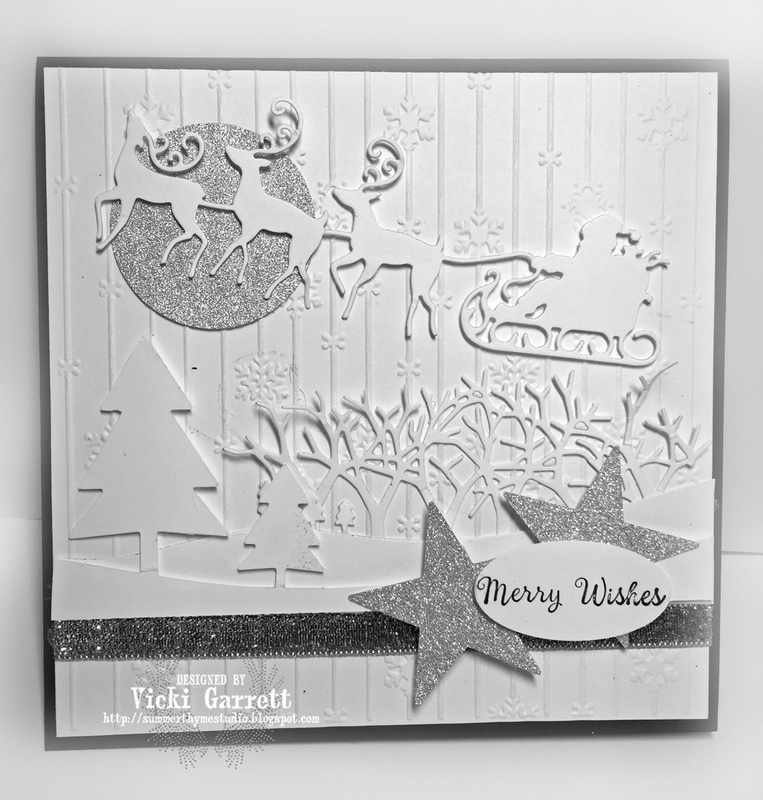 Have you got any Christmas Cards made yet? I scored the paper at 13/4" and 6"
Then I scored lengthwise along both sides at 1/2"
Christmas Trim to 1 1/2" x 4"
Merry Magic to 3.5" x 4"
To add more dimension to the Sugar Plum Die cuts Craft Kit Gingerbread peeps, I added sponging with Tim Holtz Distress Ink and then added some liquid applique accents. I added the dimensional dots, which will be used to close up the card when the gift card has been inserted. 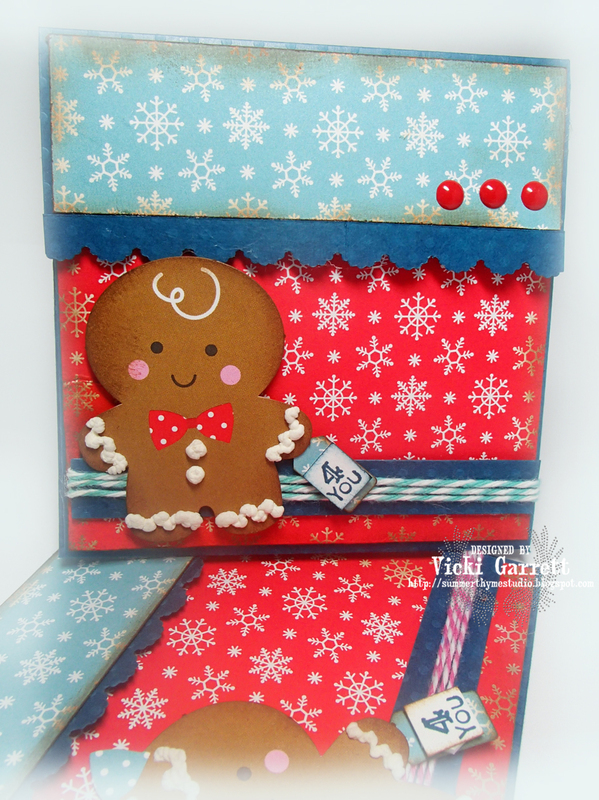 The inside panel, which holds the gift card is 3.5 x 4"
Hey there! How are you all doing today? Our challenge this week is Fall Floral. I have to admit, that I don't have a LOT of floral stamps, but am more a fan of Foliage, so that's what I worked on! I cut a Stencil using the Maple Leaf in the Leafs Die Set and Stencilled in Cajun Craze Ink over the embossed image. 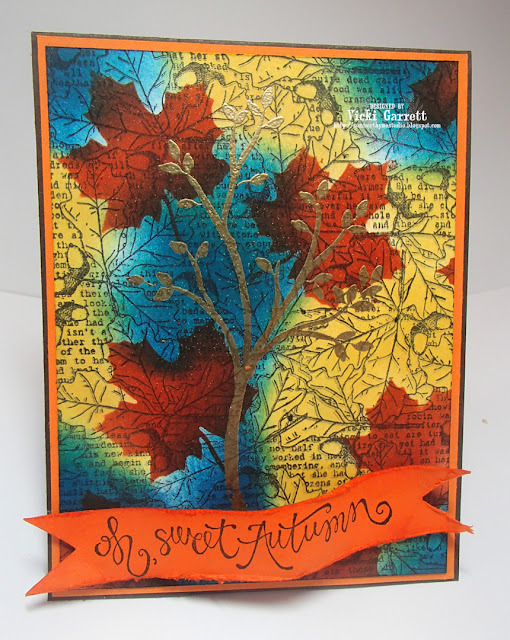 I took Night of Navy Ink and sponged around the branch and other areas of the card, adding some shadow onto the leaves for added dimension, followed by Daffodil Delight ink. So I made my first Periscope Video showing how I made my card! Please be gentle on me if viewing it, It was my very FIRST Instructional Video EVER! 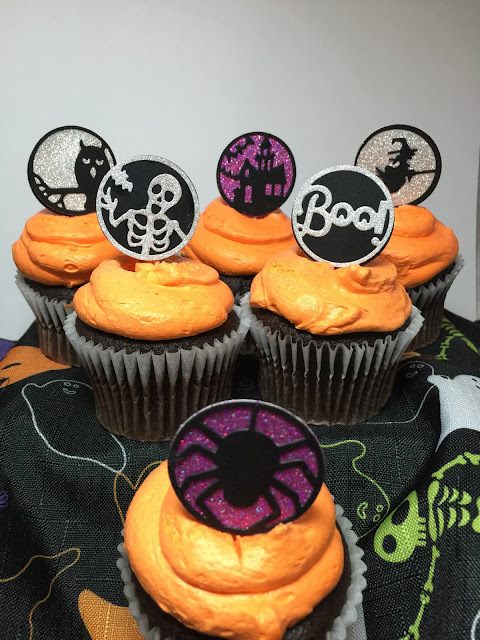 Be sure to enter your card over at IO stamps to earn a chance to win a gift certificate for new Rubber or Dies or some other goodies from the store! You can see all the details for the challenge, as well as links for todays' DT players!